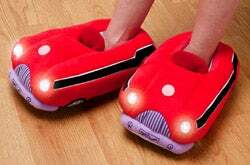 We've seen flashlight slippers before, but were they in the shape of a car? Definitely not. These Illuminating Car speakers? Definitely shaped like cars.